I’ve been a fan of Canadian writer-artist Jeff Lemire since I first read his Essex County trilogy. After that I started to read the rest of his works that were published at the time and I’ve followed his career as he started to write superhero comics for DC Comics. While Essex County was his breakout work, his first comic was Lost Dogs. He came to greater renown working on a now completed ongoing series for Vertigo Comics called Sweet Tooth. In the past few years he’s been alternating his superhero work with more personal and less mainstream projects with other publishers. His work for DC has been mostly writing and occasionally illustrating superhero comics. He’s worked on Superboy, Animal Man, Justice League Dark, and Green Arrow. His non-superhero comics include a retelling of H. G. Wells’ novel The Invisible Man. Generally speaking, I get a very different kind of enjoyment out of his standalone projects that are both written and illustrated by Lemire. Essex County, The Nobody, and Underwater Welder are all excellent reads. It’s only natural that I got excited for his latest standalone project when it was announced that Lemire would be doing a science fiction love story for Vertigo. The story is set in two time periods, the primary one being in the year 3797. There, a scientist named Nika Temsmith has been trying to unlock the secrets of trillium, an alien flower. Her goal is to find a potential cure against a sentient disease that has killed all of humanity save for a few thousand. Most of Nika’s research is done near an alien city that is shaped like an Incan pyramid. In 1921 a veteran of the First World War, William Pike, is suffering from PTSD. He’s part of an expedition to find the lost temple of the Incas, somewhere in Peru. Both of their lives become intertwined when Nika travels through time and space to find herself face to face with William outside the temple. The temple and the trillium flowers help them to communicate despite their differences in language and culture. As consequence, the fate of their lives is intertwined with humanity’s survival in the future. Trillium had tons of potential and I admit I had high hopes but having just read all eight issues in the collected trade paperback edition I can’t help but be disappointed. There are numerous problems with the story that I can’t help but feel Lemire may have rushed this comic while trying to juggle many of his other projects. His art has always had an unpolished, sketchy quality to it but it’s always been characterized by his ability to effectively capture tone and convey strong emotions. By opting to write a science fiction story Lemire has, perhaps unintentionally, revealed one of his greatest weaknesses as an illustrator. His design work is inconsistent and not always convincing. The science fiction elements such as the space ships, the space suits and the laser guns are torn between futuristic designs and retro designs. The laser guns look like cartoon laser guns and the space suit helmets look like goldfish bowls. It’s inconsistent to the point of distraction. Additionally, the aliens are underwhelming. They’re far too humanoid in appearance and while I could excuse that if this was a television series with a restricted budget but Lemire’s pen doesn’t have those same restraints. It’s unfortunate but his style isn’t detailed enough to support the kind of visuals required by the story he wrote. There are certain pages that include dozens of characters, dense jungles or larger than life settings. You get an idea of what Lemire was trying to accomplish but it falls short of his vision. Visually the comic gives you the sense that the science fictional elements don’t really matter. They are set dressing and have little consequence on the overall story. The sentient virus, the space colonies, time travel and the use of the Incan ruins as a time travel device are all good ideas but they do no work together cohesively. The aliens were particularly problematic as they didn’t play any role beyond protecting the flowers and then given them to Nika for an undefined use. 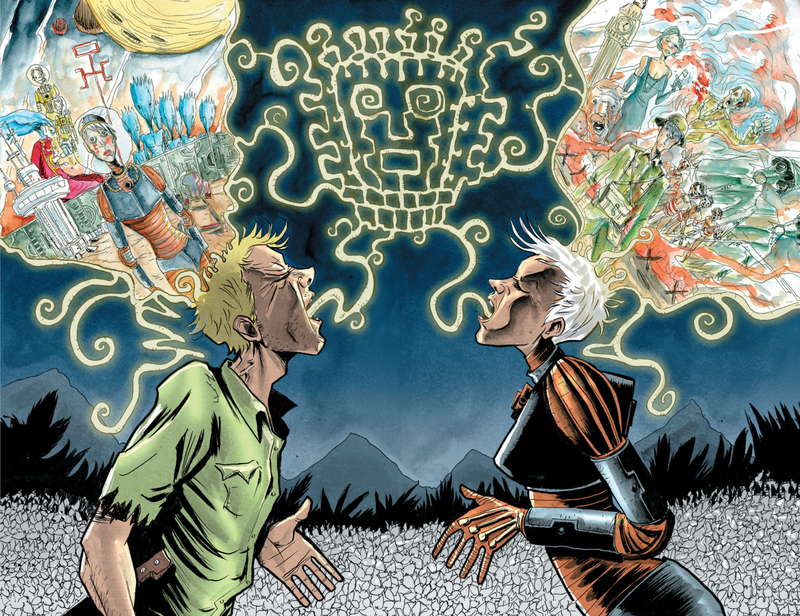 Lemire worked closely with letterer Carlos M. Mangual to develop an alphabet for the aliens and most of their dialogue is written in that form. It’s a nice detail but it’s completely unnecessary. I haven’t used it to translate too much dialogue but the bubbles I did translated didn’t have anything substantial to add to the narrative. Another thing that is poorly used is the trillium flower. Why is it important? The first issue suggest it might be useful for developing a cure against the virus but it’s used as a product to expand the mind and help overcome language barriers between different characters. That would be fine if it played a role in the story aside from allowing for the main characters to connect, but it doesn’t. You could say that having the main characters connect is important to the story but I felt the romance story was very forced. It was very unemotional and we’re not given any reason for their being a relationship between the two aside from the shared memories caused by the ingestion of the trillium flower. They are both misplaced from their time period and because of that I could understand that they’re linked, but love? Even romance? I don’t see it. I certainly didn’t feel it. The book isn’t all bad though. 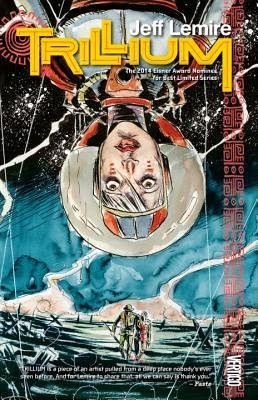 Lemire is a skilled storyteller and even when he creates something as flawed as Trillium it still has its positive aspects. The most enjoyable thing about Trillium is that Lemire is stepping out of his comfort zone. A lot of his work is either set in a small tone and deals with themes of isolation and identity. He’s also done a lot of superhero work that has used those same themes but he has also explored other interesting ideas with those comics. He’s yet to do a story set firmly in the science fiction genre (you could argue that superheroes fall in that category). He’s challenging himself creatively and some of those shines through successfully here but not enough to make this a worthwhile read for readers unfamiliar with Lemire’s body of work. While the story and the world building are disappointing, the skill with which Lemire illustrated his comic is as impressive as ever. The use of flip flopping page layouts works to the story’s advantage. The overall sense is one of disorientation which helps the reader identify with Nika and William who are experiencing an even greater disorientation due to the time travel and other strange and unexplained science fictional phenomena. Lemire forces the reader to flip the book around and read sideways. One issue splits every single page in two with one story being told on the top half. The second story on the bottom half requires you to flip the entire book completely over for the duration of the issue. Lemire also works with regular contributor José Villarrubia who handles the colouring. Villarrubia is one of my favourite colourists in the business because he’s able to change his colouring style to best match the artist he’s working with. That’s true of his work with Lemire and it really shows in Trillium. Villarrubia’s colouring looks like watercolours and it helps to highlight the strangeness of Lemire’s story as well as the unusual quality of Lemire’s linework. These two creators make an excellent team and it’s a joy to have a story that allows for Villarrubia to show off some different tricks. My excitement may have led to my less than positive reaction to Trillium but that doesn’t change the fact that it was one of the biggest missteps since the beginning of his career in comics. That’s not to say that it’s all bad. I recognize and appreciate the fact that Lemire tried something different. He could easily have spent his time writing yet another superhero comics or an equally formulaic story and ended up with a more enjoyable comic. I’d rather read an interesting failure than a bland, yet successful, cookie-cutter comic book. I’m convinced that Lemire has learn a lot about his abilities to tell this kind of story, something that is truly outside of his comfort zone if you compare it to his previous work. He pushed beyond his usual story limitations and even though the end result wasn’t impressive, his artistic devotion to create something new and different was still satisfying to me as a fan of his work. I can only trust that it was equally satisfying to him as an artist and that he will continue to expand his horizons and develop his storytelling skills. 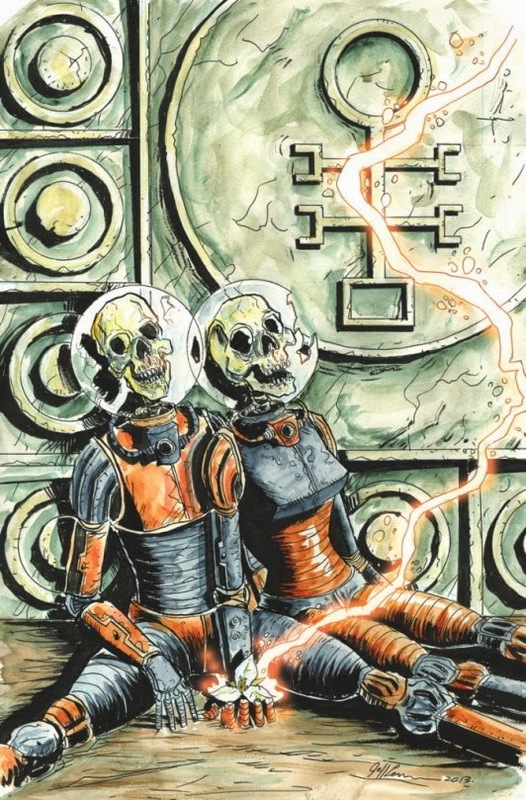 Trillium will certainly not be the last comic of his that I read and I’m already anxiously awaiting the next one.